Debon proves that it’s never too early to fine-tune a child’s sense of nostalgia in a story that harks back to the sideshow days of old, when weightlifting ranked among the great spectator entertainments. 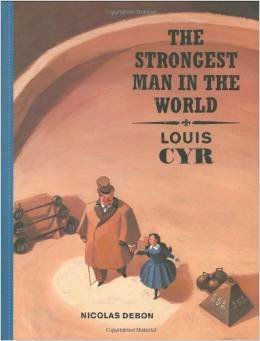 At the turn of the twentieth century, when Canadian Louis Cyr, « Champion Strongman of the World, » is informed that he must retire, he tells his young daughter about his exploits besting challengers with little more than a flex of his awesome physique. Children familiar with modern strongman competitions on ESPN will easily recognize the seeds of such outlandishly fascinating contests here, as burly fellows lift draft horses off the ground and bend iron poles into pretzels. The artwork, presented in a series of small boxes, graphic-novel style, is colored mostly in hues of orange that contribute to the period feel of the scenes and transport readers to a time gone by. Children will be touched when, following his last performance, Cyr turns his back on the adulation of thousands for the awe of his little girl. In ESl you have to find tricks to make your students want to read Ilitterature. This is an easy read. Most student already know the story and many of them have seen the movie which makes the read even more enjoyable. We have two copies available at the board. Contact me for ideas on how to work with graphic novels. Don’t forget that we have two sets of graphic novels you can use for your secondary 2 and 3 students. Ce contenu a été publié dans Capsules littéraires, Littérature - Anglais par Audrey Lasalle, et marqué avec graphic novel. Mettez-le en favori avec son permalien.